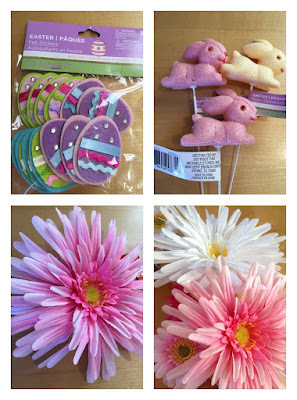 With Easter fast approaching, I decided to share with you an easy to make Spring/Easter Wreath. I made this wreath a few years ago and I decided to share it with you again. This wreath is so easy to make. 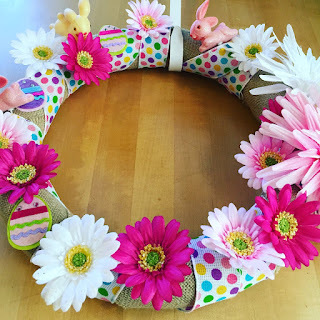 The easy part about making this is that there is no glue involved to make this wreath. You can't beat that! All of the items to make this wreath were found at Michaels craft store a few years ago. If you can't find the exact items in the craft store then you can use similar items to make this wreath. I am sure you can find some of these items at my favorite store Dollar Tree to make this wreath. 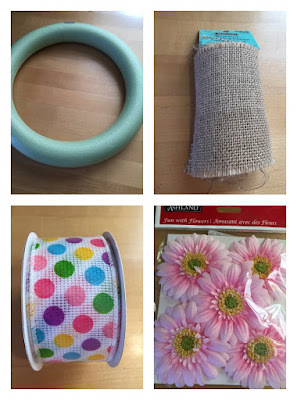 Take the foam ring and tape the burlap onto the back of the ring. 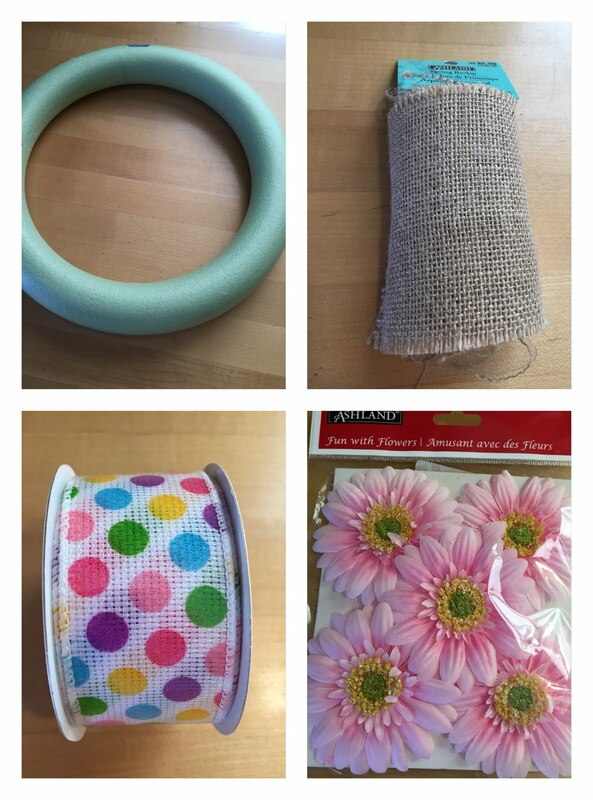 Then wrap the burlap all around the ring to the end and tape. Next, tie the ribbon onto the ring and wrap all the way around the ring. 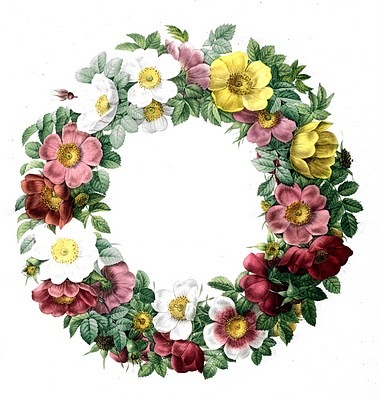 Next, add the two big flowers onto the side of the wreath by clipping them onto the ribbon. 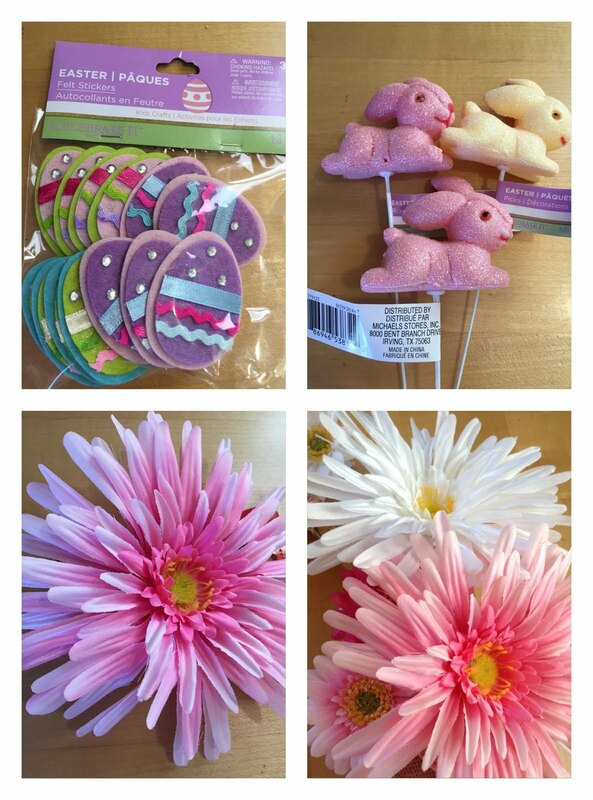 Next, add in the smaller flowers and bunnies by tucking them into the ribbon. Thanks for stopping by and see you all soon! It's so bright and colorful Julie! You did a great job with your Easter/Spring wreath! Beautiful Julie...I love the festive colors! such a beautiful wrath...love it. Hi Julie, your creativity is a blast..I wish I had one like that. Have a lovely day! 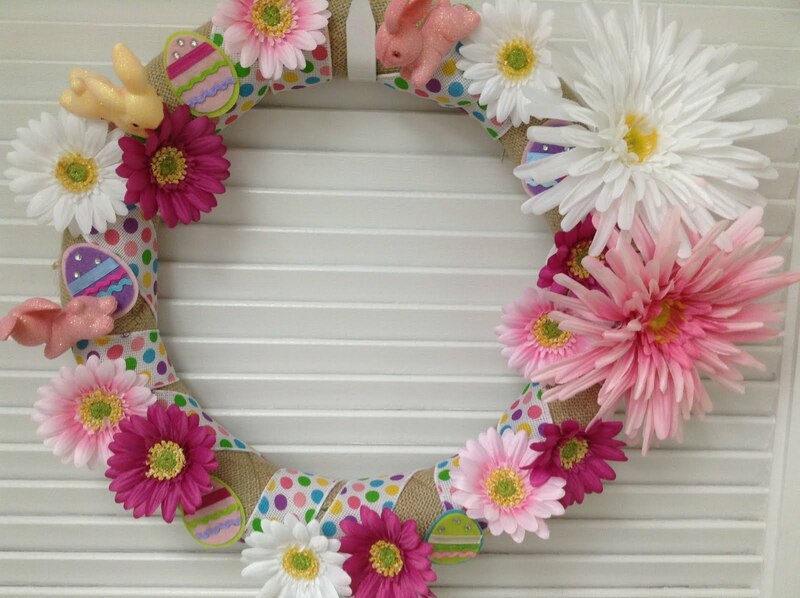 Such a pretty and lovely Spring/Easter wreath Julie! Oh, it's so pretty! It reminds me why I love spring so much. This is so sweet and festive, Julie! Thanks for sharing at Vintage Charm! So cheerful, Julie! Love it! Julie, what a pretty wreath! Thank you for sharing. You are one of the features at the Make it Pretty Monday party at The Dedicated House. Here is the link to this week's shindig. http://www.thededicatedhouse.com/make-pretty-monday-week-290/ Hope you have a lovely week!